Kingsway announces the North American launch of Love Divine, an album that celebrates the legacy of one of the most significant voices in church hymnody: Charles Wesley. The project, which releases April 19 with distribution in the U.S. through EMI CMG, unites the treasured hymns of Wesley with today’s modern expression, joining the dots between two centuries of the worshipping church. 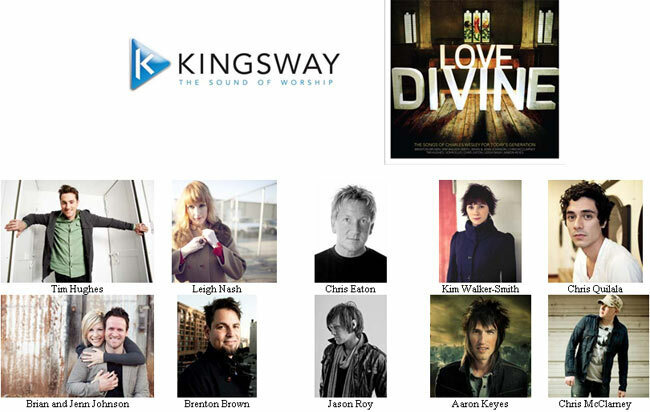 Each of the thirteen tracks on Love Divine has been arranged by Chris Eaton and John Hartley, and recorded by some of the leading contemporary vocalists today, including: Aaron Keyes, Brenton Brown, Brian Johnson (Bethel Live), Chris Eaton, Chris McClarney, Chris Quilala (Jesus Culture), Jason Roy (Building 429), Jenn Johnson (Bethel Live), John Ellis, Kim Walker-Smith (Jesus Culture), Leigh Nash (Sixpence None The Richer), Mark Roach and Tim Hughes. Having written and published well over six thousand songs during his lifetime, 150 of Wesley’s songs are found in the Methodist Hymns and Psalms hymnbook, and in the three centuries that have passed since his birth, few hymn writers have exceeded his output. Charles Wesley’s hymns enabled the church of the time to remember and experience the Bible, even if they were unable to read it.